With the need to fill the supply and demand gap for oil and gas; came the monster we all humbly call Oil tankers. With recent introduction of tankers in shipping; it soon become a common norm to carry cargo in bulk. It’s after the 19th century when we started to carry liquid cargo in bulk. In recent times an oil tanker is refereed to those tankers which carry liquid petroleum; whether crude or in refined form. Since tankers are designed to transport cargo in bulk; oil tankers ensure continues flow of oil to industries and your home. Based on the type or grade of petroleum product it carries; oil tankers are divided into two main type i.e crude oil tanker and product tanker. While crude oil tanker deal with large sum of unrefined petroleum; product tankers carry refined petroleum ready for consumption. Also with ever growing demand for black gold bigger and bigger tankers came into picture. They are from the smaller coastal tankers to the mammoth ship’s ( Supper Tankers ) carrying 700,000 tones of liquid cargo; something we will discuss in details later in this article. The specific design characteristic’s of an oil tanker vary based on its size and type. But in general all tankers are somehow divided into three main zones; the cargo area, the fore and aft end. The fore end is responsible to cut through the water and ensure ship’s stability through fore peak ballast tanks. The aft end is where all the accommodation, bridge, pump and engine room is located. It’s basically the heart of the ship from which it is operated. The real deal is the cargo area where the oil is stored in dedicated tanks. These dedicated tanks are further divided into mini sub section using bulkheads and frames to prevent sloshing of fluids in cargo tanks. If remained unchecked they can dangerously affect ships stability. For those who don’t understand what sloshing means; its the movement of liquid from one side to another under the influence of rolling and pitching. Cofferdams are provided in between the cargo space and the engine room to isolate and protect against possible hazards. These cofferdams runs from top to bottom throught the forward engine room bulkhead; thus dividing the ships structure into hazardous and non hazardous zones. While small and medium sized oil tankers use combination of longitudinal and transverse frame structure. Large tankers are made of longitudinal frame structure. In the system longitudinal frames run across the entire length of the ship; with intersection or support from transverse bulkheads. These longitudinal frames provide protection to the ships bottom shell from buckling due to hogging and sagging. Together with the side shell, bottom structure, keel and deck plating they form the trunk. It’s basically a raised structure which runs across the ships providing designated role of an area such as cargo space. The trunk basically consist of longitudinal frames, transverse bulkhead, brackets, side frame / shell, sheerstrake, stringers, longitudinal bulkhead and deck plating. The brackets add up to the stress bearing capacity of ship by transferring stress on side shell or frame to the bottom structure. The stringers on other hand helps to improve the strength of transverse frames. This allows to reduce the depth and width of the frame needed thus adding up to cargo space. The first successful oil tanker was constructed in latter years of 19th century named Zoroaster. It was not until the dawn of 20th century modern oil tanker came into picture. These ships consists of dedicated cargo tanks at forward and aft of the engine room with pipes connecting them. Glückauf ( Name of German Ship ) was the first modern oil tanker with the facility to fill cargo holds with the help of deck cargo lines. Earlier the ships were of riveted construction with engine room and accommodation situated at its midsection. This lead’s to leakage of oil through the shaft and to the pump and engine room compartments. Latter to tackle leakage of oil to the sea via shaft clearance; accommodation and engine room were taken to the aft of the ship. Now with bigger tanks and stricter regulations oil tankers switched from riveted to welded construction. This allows for bigger and better ship designs with introduction of cofferdam in between hazardous and non hazardous area. Furthermore in accordance with more and more stricter rules based on past accidents double hull design were introduced on oil tankers. Under law all single hull tankers are to be phased out before 2026. Most oil tanker in the world are of the double hull type, thanks to the accelerated phasing out of the single hull design. Following the catastrophic oil spill of 11+ million gallon of oil in Alaska, united states passed “Oil Pollution Act 1990”. The law governs the necessary changes to be implemented to reduce such spill in future. But with growing accidents such as with Nissos Amorgos, Sea Empress and Sanchi tanker leading to acute damage to marine life and environment; the IMO took step to revise Marpol regulation 1 to phase out all single hull tankers till 2026. Now since hull is the major component of ship structure they were revised to double hull structure. But how are they different from single hull construction and helps protect environment; lets learn in below one on one analysis. 1. It is a ship with single hull structure which carry oil from one point to another. 1. It is a ship with double hull construction which carry oil from one point to another. 2. Provide single layer protection in form of water tight layer surrounding ship structure. 2. Provide double layer protection with separate layers of watertight hull plating with space in between. 3. More dangerous to marine environment in event of accident. 3. Less dangerous to marine environment in event of accidents. 4. No such Arrangement. 4. The space between the two hull plating is used for ballasting and deblasting purposes. 5. Less surface area to clean, maintain and repair. 5. Three times more surface area are available to be repaired, cleaned and maintained due to double hull structure. 8. Less susceptible to structural failures. 8. More susceptible to structural failures. 9. Provide No Protection against Impact of any kind. 9. Provide protection against low intensity impact. 10. Ballast space are less accessible. 10. Ballast space are more accessible. Crude oil is a major factor in driving industrial activity across the globe right from power, industrial to consumer sector. It’s been power house for the growth of nation’s for quite some time and are going to remain that way for some time. While almost all countries in world need oil for industrial activity; there are only few to provide them. This leads to the gap between supply and demand of crude oil and leads to price hike. 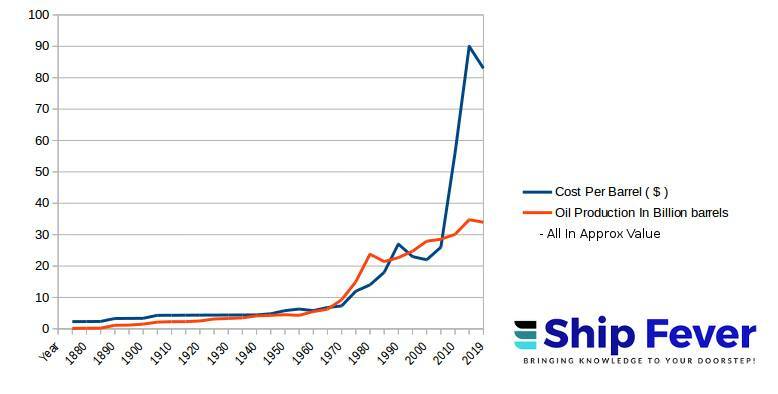 The demand for oil has gone from less than a billion barrel per year in 1900 to more than 30 billion barrels of oil each year in 2019. On other hand the price of oil rise from less than 5 dollar per barrel to around 80 dollar per barrel in 2019. After the second world war the huge gap in demand and supply of oil leads to development of bigger and better oil tankers. The large size of the ship’s provide large sum of oil; to be carried at a time for relatively similar cost of operation. Thus by the 1950’s first supper tankers starts to arrive in the form of Suezmax. The large ships which can navigate through the Suez canal. But due to overgrowing demand and oil prices with temporary closure of Suez canal in 1956; open the gates for the construction of large super tankers. These large super tankers in the form of VLCC and latter ULCC were able to transport more than 300,000 DWT of oil in one voyage. These large ships can carry up to 4,000,000 barrels of oil at any given time. An oil tanker can be of six major type based on its size and amount of cargo it can carry. 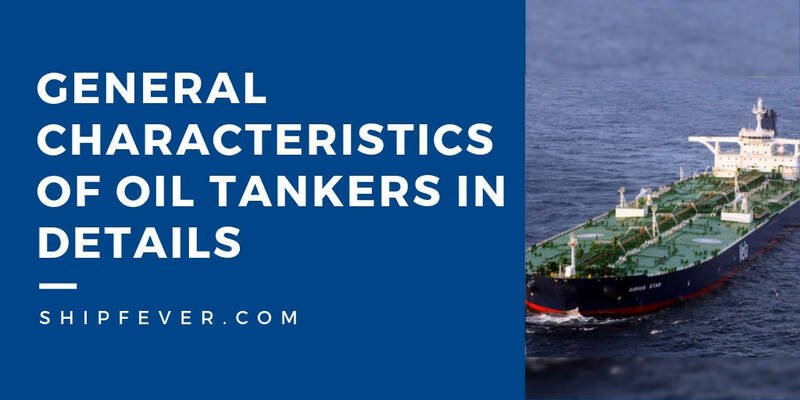 The most common type of oil tankers used today are the VLCC and ULCC types. In comparison modern oil tankers such as VLCC and ULCC are longer in length than aircraft carriers. The largest ship used in navy to support take off and landing of aircraft. Regular Tankers : These are the ships which came under the small and mid category of oil tankers with 10,000 to 60,000 tonnes of dead weight. They are usually tankers that run in coastal reason load and unload cargo from large tankers in case of sallow port or harbor. Panamax Tankers : The largest oil tanker which can pass through panama canal is known as Panamax. These ships are most used as the product tanker carrying refined petroleum. Usually these ships have a dead weight of 55,000 to 80,000. One such ships can carry oil up to 500,000 barrels at a time. Aframax : Not all ports can handle ships of very large size due to geographical and draft restrictions. This is when ships like Aframax came handy. These ships with a dead weight of 70,000 to 120,000 tonnes are used in Mediterranean, black sea, Caribbean and china sea in between ports with not too deep draft to handle larger ships. Suezmax : Just like the Panamax the Suezmax is the largest size of vessel which can pass through the Suez canal. These ships carry both crude and refined petroleum and are of about 120,000 to 160,000 tonnes of dead weight. in lay man terms it accounts for almost 1,000,000 barrels of oil carrying capacity. VLCC : The VLCC or Very large Crude Carrier was first developed in 1960’s. This is the most used oil tanker types in the shipping industry with 2, 50,000 tonnage of dead weight. These ships are capable to carry more than 2,000,000 barrels of oil in one voyage. These ships are mainly used to transfer oil from gulf countries to the market in Europe and south Asia. ULCC : The ULCC or Ultra Large Crude Carrier are the big mammoth ship’s which can carry large amount of oil from one place to another. These ships have a dead weight in between 320,000 to 500,000 tonnes. Due to their very large size these ships are restricted to ports with specialized terminals. The ship operate between gulf to North America and to south china sea. There is a great deal of effort taken by national and international authorities to maintain safe passage of oil tankers at sea. The different regulation and strict rules ensures there is no damage to the marine environment. But when accidents happen we all have seen how badly it damage the local ecosystem. It was one of the first oil spill of the time in which almost 25 million barrels of crude oil went to the sea. The oil tanker Torrey canyon was among the first few supertankers in 1967. The ship was overloaded with almost 120,000 tonnes of oil rather than 60,000 tones of safe limit when it strike with the coral reef just outside the port of Cornwall. It was the first such spill of the time with oil spreading up to 270 square miles affecting coastlines and marine environment. The accident happen due to grounding of single hull structure which then rapture the hull leading to the spill. The royal navy then had to respond by dropping bombs to burn off the oil at sea. On 19 December 1972 a Brazilian tanker collided with the a south Korean super tanker ( Sea Star ) off the cost of Oman. The collision lead to the spill of more than 35 millions barrel of oil in gulf of Oman. The super tanker sink on the 6th day of the accident following a series of massive explosion. While the crew escape safely the damage to the environment was huge. It takes around a week for the clean up operation spending millions in the process. On 16 March 1979 a very large crude carrier named Amoco Cadiz undergone grounding near the coast of Brittany in France. The ship was navigating though the rough seas in English channel when it losses control over its rudder. The ships basically drifts by the sea waves only to undergone grounding near the cost of France. The accident then lead up to more than 70 million barrels of oil spill near the cost line. The incident in total leads to a huge loss of maritime life and environment near the coast. The cleaning operation then required millions of dollars with large labor participation in cleaning effort; other than the penalty paid to the authorities. The two supertankers collided with each other off the cost of Tobago in July 1979 during a storm. The two ships Atlantic Express and Aegean Captain were sailing in opposite direction when they hit through in the middle of storm in Caribbean sea. While the one was in en-route to Beaumont from Saudi Arabia the other was going for Singapore from Aruba. The collision lead to sudden explosion on both the ships with an oil spill of more than 88 million gallons. The Atlantic Express sank deep in sea quickly after the series of explosion and fire. This accident lead to the loss of 26 crew members life due to explosion and fire. In August 1983 an oil tanker named “Castillo de Bellver” capsize after a uncontrolled fire. The ship break into two separating from the stern section. The accident results into the oil spill of more than 70 million barrels over a period of a month from sunk tanker 70 miles away from the coast of South Africa. 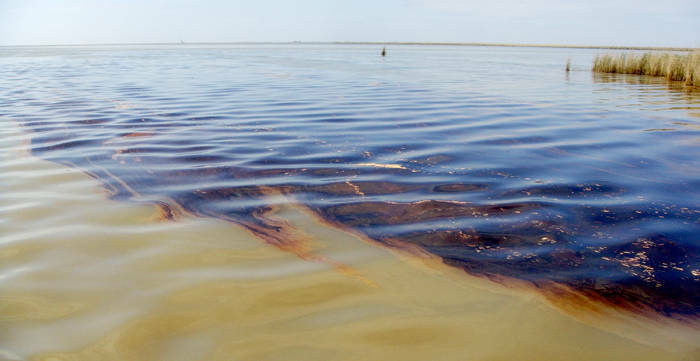 Although a portion of the huge sum of oil it carries burn during the fire before it capsize; the environmental damage due to the spill spilled there after was detrimental. The VLCC named MT Haven suddenly exploded near the cost of Italy when it was discharging oil to the shore using floating platform. The sudden explosion lead to the sinking of the ship no time. The accident lead to the causality of six crew member who were injured during the explosion and never exit the ship. The ship was carrying around 140,000 tones of oil left in its cargo oil tanks of its 250,000 tonnes capacity when the accident happened. The accident lead to the spill of about 45 millions barrels of oil. The term freeboard stands for the distance between the upper deck and waterline. It’s the most important aspect of ships safety under volatile weather condition. In general ships with higher freeboard provide better stability in bad weather with extra reserve buoyancy. This is why all sea going vessel needs to maintain minimum freeboard assigned by the ICLL to designated ship type. The minimum freeboard required by the ship is assigned by the ICLL based on the ability of the ship to maintain its structural strength and required buoyancy. Now since oil tankers have greater metacentric height ( GM ), lower permeability with more number of sub divisions in ship’s structure; they are allowed to have lower freeboard than other ship’s type. Furthermore having no to little deck openings with large number of pumps and greater overall buoyancy helps win the case to keep freeboard low. Having less deck openings and availability of different pipelines connected to pumps helps maintain stability in case of flooding. Thus an oil tanker is the most suitable ship to provide allowance to run even with lower freeboard area. Unlike major systems common to all ship’s type the oil tankers have few specific system unique for itself. These are mainly related to the safety of cargo, its discharging and upkeep. Crude Oil Heating System : The Crude oil generally have higher pour point with high wax content which leads to the need for constant heating. The cargo temperature should never fall below their pour or cloud point; thus heating coils are provide to ensure constant viscosity. It is required to maintain oil temperature level above minimum transit temperature level requirement. Heating the oil also helps with discharge operation. Inert Gas System : Inert Gas System with its alarms and trips are among one of the critical safety equipment every oil tanker should have. Under SOLAS Convention – Chapter two (1/4.5.5 and 2/16.3.3) all oil tankers above 8000 Dwt are required to have proper inert gas system installed on ship. The system prevent any possible accident or fire in cargo tanks by replacing the oxygen with the inert environment. The complete process takes continues discharge of inert gas into cargo tanks replacing air or oxygen within. Cargo Operation : The loading and discharging of liquid cargo to and from the ship is known as cargo operation. In both loading and discharging the process starts with a slow speed then at steady state and at last again at slow speed. The slow speed at start and end of the process helps ensure the transferring of cargo from ship to shore or shore to ship is going as per the plan. While during loading the oil is directly pumped into the dedicated tank using the gravity through deck lines. But the discharge operation is carried out with the use of dedicated cargo pump in pump room. Tank Cleaning And C.O.W ( Crude Oil Washing ) : Not all oils are compatible with each other and vary depending on the location of extraction or dissolved content. Thus tanks are required to be clean before taking different grade of oil. Furthermore they are also required to be washed and cleaned for maintenance and inspections. On another hand crude oil washing is an integral part of discharging operation; where the jet of crude oil is directed on to the walls of tank to remove any wax or residual fuel. Note : This Article is produced on request from “Esinaso Daka“.